Accreting supermassive black holes located in the center of galaxies, known as quasars, are the most luminous persistent sources in the Universe. Hundreds of thousands of them have been observed and spectroscopically confirmed up to redshift higher than 7, corresponding to an age of the Universe of less than a billion years from the Big Bang. As a consequence, they would make ideal “standard candles”, i.e. objects with a known luminosity. However, even if several methods have been proposed in the past to estimate the luminosity of quasars (some references are given in the paper) no real breakthrough has been achieved in this field, due to two main limitations: either the luminosity estimate is quite accurate but requires a large observational effort (thus possible only for a limited number of objects), or it is easily applicable to a large number of quasars but it is not precise enough to provide meaningful tests of cosmological models. One of these methods is based on a non-linear relation, known since the 80’s, between the X-ray and ultraviolet emission of quasars: more luminous quasars in the ultraviolet tend to have a smaller fraction of their total light emitted in the X-rays. The ratio between the X-ray and ultraviolet fluxes provides an independent measurement of the quasar luminosity, hence of its distance. Thanks to this technique we can build a Hubble diagram for quasar, a distance-redshift relation that allows us to test cosmological models up to very early cosmic epochs. When we started using this relation to estimate the luminosity of quasars the task seemed impossible. In fact, the method had both the limitations described above: too few sources with both X-ray and ultraviolet observations were available for a meaningful Hubble diagram; and the dispersion of the relation was too high (the uncertainty on the distance estimate was higher than a factor of three). However, two key advances changed the game completely: 1) the Sloan Digital Sky Survey quasar sample and the XMM-Newton serendipitous source catalog brought the number of quasars with both X-ray and ultraviolet observations from a few hundreds to several thousands; 2) we discovered that most of the observed dispersion of the relation is not intrinsic to the emission process in quasars, but rather due to observational uncertainties and contaminants, such as dust reddening or gas absorption. Our Hubble diagram includes 1,600 quasars at redshift between z = 0.01 and 5.1, including a new group of 18 objects at z > 3, with dedicated XMM-Newton observations. This new sample, from an XMM-Newton Very Large Program, is pivotal to increase the statistics at high redshift (where most of the new cosmological information resides) and to check the reliability of the method with high-quality data. This Hubble diagram is the most complete description of the expansion of the Universe in the epoch between the most distant supernovae and the cosmic microwave background (CMB) radiation. The results of the cosmological fits to the combined supernovae and quasars Hubble diagram are both interesting and unexpected. We find an excellent agreement between quasars and supernovae up to z~1.5, with the data being well described by a concordance flat LCDM model with WM=0.3 and WL=0.7. Yet, the extrapolation of the concordance model fails to reproduce the data at z > 1.5, with a ~4 s tension. If we model the data with an evolving equation of state of the dark energy, we obtain a best fit value of the w parameter lower than -1, corresponding to a so-called phantom dark energy. Interestingly, this solution also solves the present 3.7 s tension between the locally determined value of the Hubble parameter, H0, and the value inferred from the CMB. 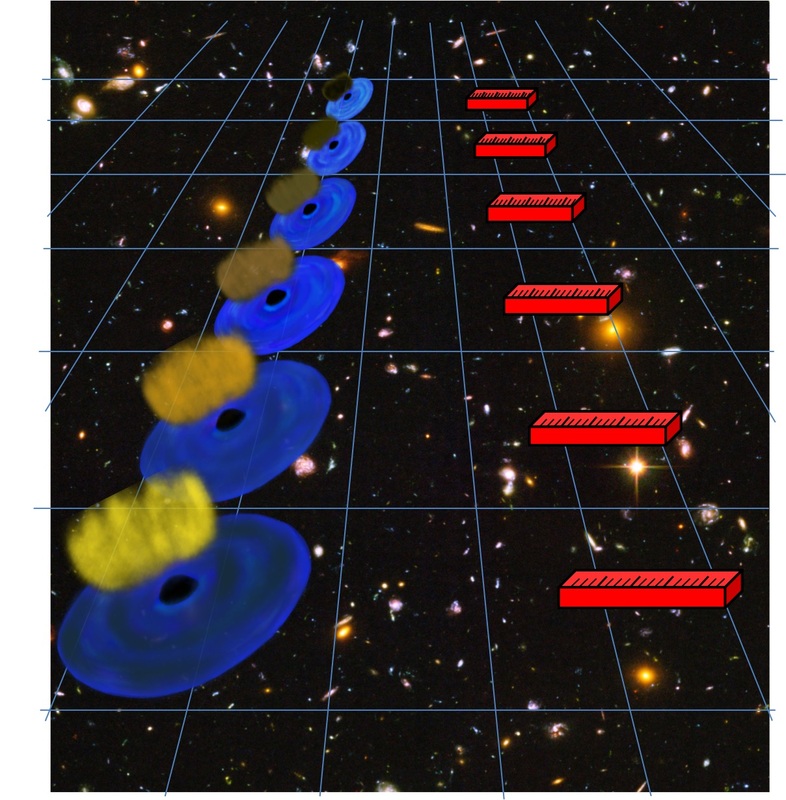 Figure 1: an artistic impression of the use of quasars as cosmic rulers: when the UV luminosity from the disk (in blue) is higher, the X-ray emission (in yellow-brown) is relatively fainter. From the ratio between the X-ray and UV emission we can estimate the luminosity of the quasar, hence its distance.